Summer grilling season is upon us, spice things up this year with a spicy grilled tuna! 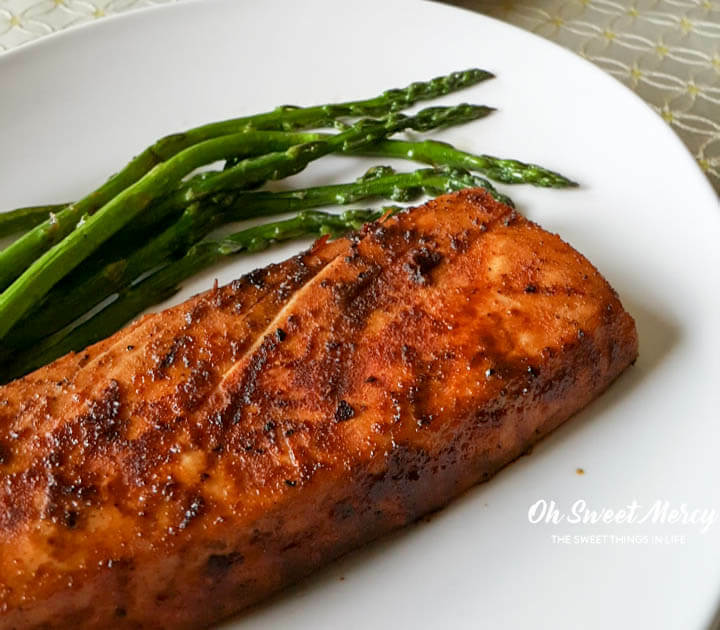 My easy-to-make dry rub can be customized to suit your preferred level of heat and results in a delicious, flavorful grilled fish (or chicken or beef)! Trim Healthy Mamas this tuna steak seasoning adds flavor without fat, perfect for E meals! Why choose a dry rub instead of a marinade? There’s nothing wrong with marinating of course. The marinade I developed for this Paleo Italian-Marinated Steak and Mushrooms at Wilderness Family Naturals was absolutely delicious! One problem, though – you need to plan ahead! You simply must give meats time to soak in the marinade. Early morning: wonder what we should have for supper? Late afternoon: wonder what we should have for supper? Half hour before supper should be done: wonder what we should have for supper? For those days when you just don’t have time for marinating, a dry rub is perfect. It imparts flavor in no time. Dry rubs also last as long as the spices last and don’t need refrigeration. This makes a dry rub the perfect thing to take camping, too. Make your own dry rub! Commercially made spice and seasoning packets are handy. Unfortunately, they also often contain unwanted ingredients like sugar, maltodextrin, and even wheat. If you’re a Trim Healthy Mama or have food allergies, making your own dry rub is best. It couldn’t be more simple either – just mix up some spices you probably already have in your kitchen. You control what goes in it and leave out the unwanted ingredients. With this easy rub you can also make it as spicy (or not) as you like. Although I’m not a fan of cooking in aluminum, my hubby makes a little foil boat to cook fish on the grill to keep it from sticking. I asked him to please try and get some grill marks on it because I needed a mouth-watering photo for the blog. While he cooked it most of the way in the little aluminum boat, he did put the tuna steak directly on the grill for a bit and delivered a gorgeous piece of fish. I’ve just recently found an amazing post from The Organic Kitchen – Grilled Salmon with Cauliflower Rice (and How to Get Those Grill Marks!). Linda does a fabulous job explaining how to properly grill fish and get those gorgeous grill marks. That grilled salmon with cauliflower rice is definitely happening here soon! Tuna is a wonderfully healthy food. Be sure to purchase the freshest, highest quality tuna you can find (even if that means frozen). Here’s where things get tricky and often controversial. We know fish is good for us because of the omega-3’s. We also know that our oceans are not always the cleanest. Toxic heavy metals like mercury can be found in fish, and what about radiation from nuclear disasters like Fukishima? Navigating these nautical no-no’s can leave you feeling hopeless and confused. Then there’s the issue of farm-raised fish. Reports abound on the unsanitary practices of other countries. Plus, confining fish in a factory farming situation and feeding them unnatural foods like GMO corn (have you ever seen corn growing in the ocean??) doesn’t seem any better does it? Factory farmed fish tend to be more fatty, too. All you can do is the best you can do. Be smart about the fish you buy, do some research. Catch it yourself if you can! Buy the cleanest, healthiest fish you can afford, and if you’re the praying sort be sure to bless it first! Stressing over your food is just as unhealthy as eating unhealthy food. Do the best you can with what you have. 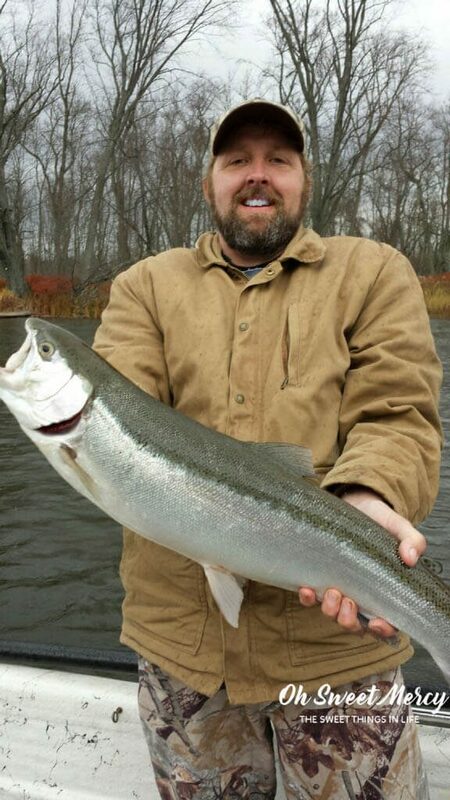 My hubby caught a big ole Steelhead trout up in the Manistee River in Michigan. It’s very similar to salmon and delicious! This rub would be great on salmon, too. Trim Healthy Mamas, here’s the rub on this easy Spicy Dry Rub Grilled Tuna. The tuna I used for this recipe was Ahi tuna that my husband got from his employer. They came frozen and vacuum sealed in 8 ounce portions. According to the nutrition label, one serving was 4 ounces. I ate the whole thing, it was so good! Oops! Nothing wrong with that of course, unless you’re aiming for a THM Fuel Pull style meal where we need to keep our protein portion to 3 to 4 ounces. A 4 ounce serving of this tuna contains a whopping 28 grams of protein, though so you’ll want to stick to a 3 ounce portion! No worries, though – this tuna is so flavorful you’ll be very satisfied. Remember to load up on those non-starchy veggies and you’ll be golden. With only half a gram of fat per serving, this is a wonderful low-fat choice for any THM fuel style. How you cook it and what you serve with it will determine what fuel type you have! You can either grill or bake this, too. For a nourishing, satisfying S meal try serving with grilled, buttered asparagus, and a half cup of fresh blueberries (or a whole cup of other berries) for dessert. Need an energizing E? Add a baked sweet potato with a teaspoon of MCT oil and seasonings, steamed green beans, and my Mango Lime Instant Pudding for dessert. Going for a Fuel Pull? Keep the tuna to a 3 ounce portion, serve with steamed broccoli, sliced tomatoes, cucumbers, and bell peppers with my Creamy Cajun Ranch, and fresh berries for dessert. For all the details on each THM fuel type and foods, be sure to read the Trim Healthy Mama plan book, available from my affiliate partner. As with anything, choosing the best quality ingredients you can will give you a more flavorful and healthy result. 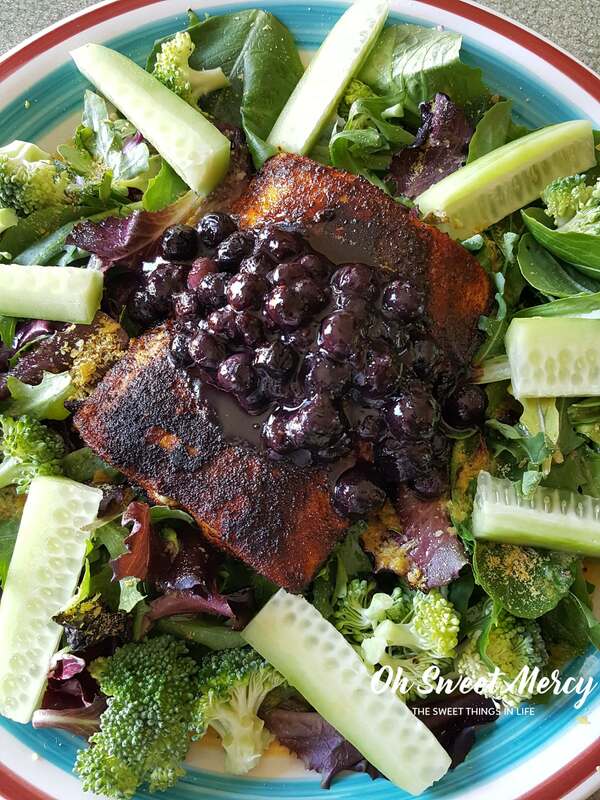 This recipe was developed using the wonderful spices from Wilderness Family Naturals! They have more than just spices though so be sure to check out all their products. I have partnered with them as an affiliate, and clicking on any of the links to their products or recipes and purchasing may result in a small commission for me. Thanks so much for your support, it helps keep this site going! Ready to make some Easy Dry Rub Spicy Grilled Tuna? 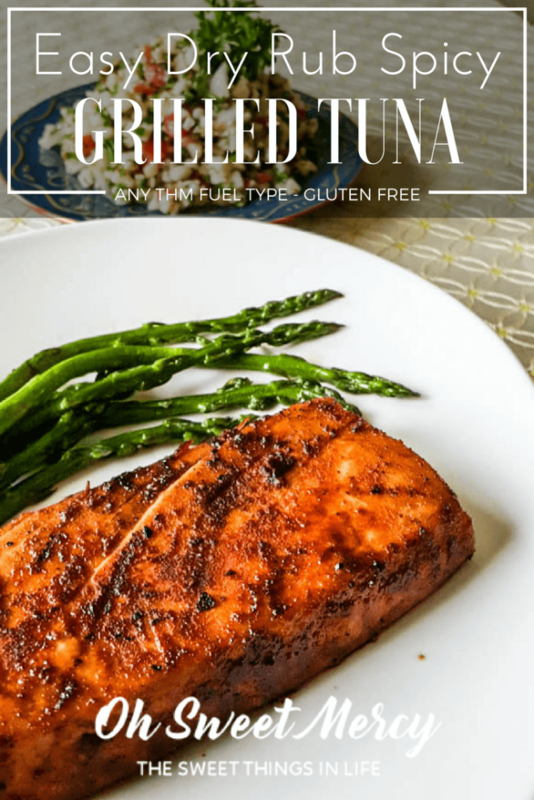 A quick and easy dry rubbed spicy grilled tuna suitable for any Trim Healthy Mama fuel type. Make it as spicy (or not) as you like! This flavorful rub is also good for any meat. 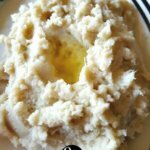 Low carb, gluten free and sugar free. 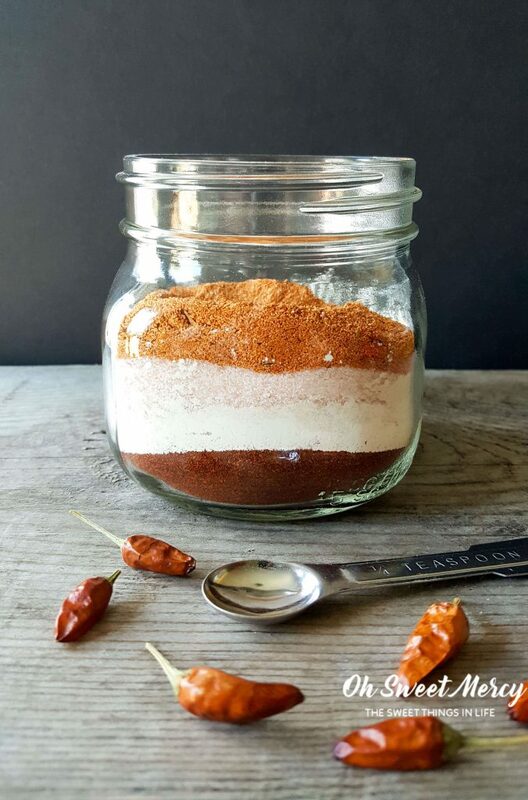 In a small bowl or mason jar, combine all the spices and whisk well to combine. Make sure your grill is sufficiently hot (see this post for helpful tips), clean, and spray with cooking spray for a low fat THM E or FP meal. Grill until done to your liking. For a ¾" thick portion of tuna approximately 3 minutes on each side for well done. As written, this Easy Dry Rub has a nice level of warmth. Increase the Cajun seasoning for more spicy heat. *Nutrition information does not include sodium in dry rub mix, only sodium in the fish. Pin this Easy Dry Rub Spicy Grilled Tuna recipe to your favorite boards! I just can’t get over how gorgeous this is! I’ve never tried a dry rub before, but now I need to… Thanks for the inspiration! Thanks so much Raia! I too was in awe of this stunning dish. My hubby has got this grill thing down, let me tell you. Love this!!! I often forget about dry rubs, and I really love them. I need to use them more often. This one sounds wonderful! Grilling fish is not for the faint of heart! Looks amazing! I think I could eat that dry rub on a shoe and like it! YUM! Ha ha! That’s what my hubby says about the way I like my meat (very well done) – “you like your steak like shoe leather!” I simply can not do any amount of pink. I’m sure when I order a filet mignon well done the chef probably swears lol. Thanks for stopping by! Great post. I grill fish all year ’round and love to use dry rubs — I’m all about putting herbs/spices on and in everything I cook. Thanks for sharing. I grill salmon, tuna, cod, trout and local pickerel – mostly.. Dry rubs are such a great idea with fish in particular!